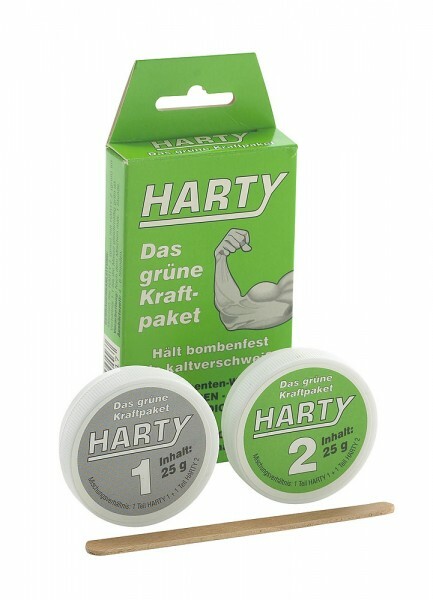 Produktinformationen "Harty - the organic power pack"
Bonding, filling and sealing - as strong as cold welding. The two-component material can be stored indefinitely, is heat, acid, oil and alkali-proof and even saltwater-proof. Suited for all materials like steel, cast iron, aluminium, wood, glass, hard plastic and ceramic. Extremely high-tensile and compression-proof. Ideal for repairing tears and holes on water pipes, motor blocks, cylinder heads, oil sumps, tanks, etc. Even threads can be renewed with Harty. Processing time: 1 hour. Hardened after 4 to 6 hours. Weiterführende Links zu "Harty - the organic power pack"